Amin professional and experienced tattoo artist in hyderabad & secunderabad with good, safe, sterile, hygenic, economical price, best, trained, with a clean & beautiful tatoo studio, training - Welcome to Amin`s Angel Tattooz and piercings studio, training and tattoo material supply in Hyderabad. Welcome to "ANGEL TATTOO AND PIERCING STUDIO" safe, clean, friendly and a modern studio. If you are looking for a masterpiece and a meaningful work of art in black and grey or color etched into your skin with zero compromise on hygiene then Angel’s is the place to be! Be it is your 1st tattoo or an add-on, we at "ANGEL’S" have the skill and expertise to give you that specific piece of artwork with custom made design to suit your personality and style! 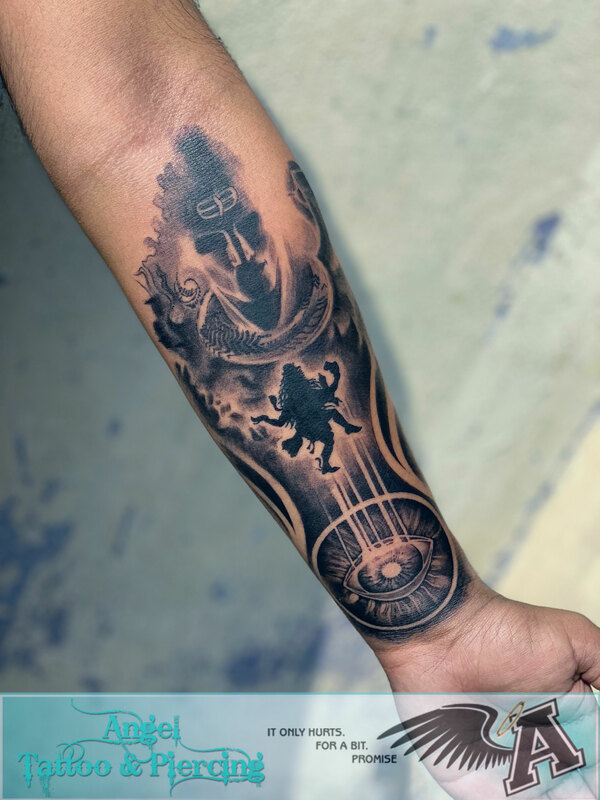 · ANGEL’S specialize in creating perfect cover-ups with all new custom made design which will make you forget about the mere existence of the previous tattoo. Our only goal – Turning a nightmare into a dream! ANGEL’S also value human emotions and understand the impact people can have in our lives and hence we specialize in creating perfect portraits of your loved which will remain with you forever as a great memory. ANGEL’S is not only into tattoos but also into piercing. We do eyebrow, nose, ear and belly piercings etc. We only use branded and sterilized accessories and equipment. As safety and hygiene is our utmost priority. We only let our work speak for itself by creating great tattoos with fine lines and smooth shading techniques and bright colors, which are the basic elements of any good tattoo. Customer satisfaction is what makes us buzz and it is our goal to achieve work you will be extremely proud of and makes you want to come back for more. So come and have an experience of a lifetime in a studio with great vibes, a friendly atmosphere and expertise to put all your doubts and inhibitions at bay.